Cambodia and Vietnam should work together to promote their popular tourist draws, particularly Ha Long Bay in Northern Vietnam, and the Angkor archaeological complex in Siem Reap, according to a Vietnamese official. Nguyen Khao Thai, an official at the Vietnamese Ministry of Information and Communication, proposed the idea. 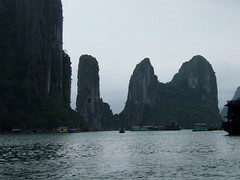 “Ha Long Bay, is one of the most beautiful bays and a Unesco-listed site that attracts around 7 million local and foreign tourists every year.